Set up holidays or other days that you will be closed. School Close Dates affect child scheduling and if you use Billing Formulas they may also affect amounts that are charged. Go to Data Management > Scheduling > dbl-click School Close Dates. 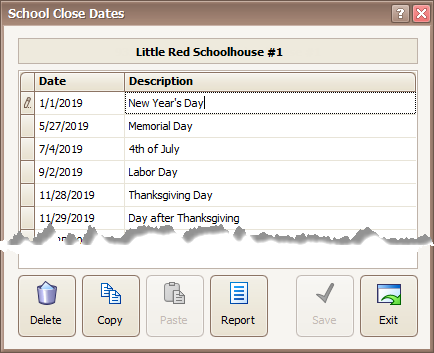 Select a Date on the next blank line and type a Description like “New Year’s Day”, “Memorial Day”, “Thanksgiving”, etc. Then tap Enter (on your keyboard) to get a new blank line. Continue adding dates as needed then click Save > Exit. If you have multiple locations with the same School Close Dates use Copy & Paste. 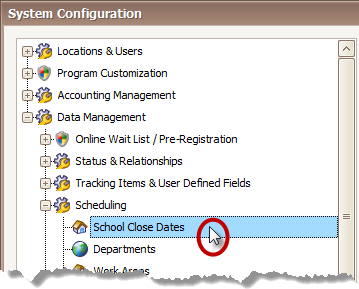 Go to the School Close Dates screen for a location that has the information you want to copy and click Copy. Exit the School Close Dates screen. You should be at the System Configuration screen with School Close Dates highlighted. Click Change School and select a location to which you want to paste the information. Dbl-click School Close Dates to open the screen for that location then click Paste. Hint: You may paste the same information to another location. Exit the School Close Dates screen, click Change School and select another location. Go to the School Close Dates for that location and Paste again. What do School Close Dates Affect? School Close Dates affect schedules for children and staff. If you charge based on a fixed Contract Cycle (like a weekly or monthly cycle) then it would have no effect on amounts that are charged. However, if your billing is based on a Billing Formula (one that is designed to look at the schedule) then it would affect billing. Since weather related closures are not known in advance they would not be entered as School Close Dates. “In Service” days usually mean days when your local schools are closed, but the center is open. School age children are actually in your care longer on days when school is out. If your business is open, then these types of days are not entered as School Close Dates. See also: How to Charge for In Service Days.